With this update, the camera will support the lens information (focal length) display of the Zoom Lens DT 55-200mm F4-5.6. A window will show the firmware version on the LCD screen. If the firmware version displayed is 1.00, 1.01, 1.02 or 1.03, you need to update the camera. 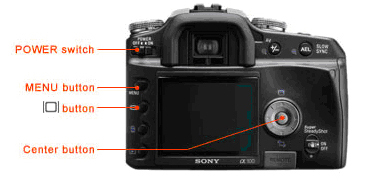 If the firmware version displayed is 1.04, you do NOT have to update the camera. A Memory Stick Duo/Memory Stick PRO Duo* with at least 16MB capacity. A CF (Compact Flash) card with at least 16MB capacity. When using Windows 98/98SE, USB connection between the camera and computer is not possible. Therefore, your computer should have a card slot, or a card reader which is suitable for your recording medium. Make sure no program is running. You must accept the terms of the End User Licence Agreement at the bottom of the page. After reading this agreement, click "Accept" ;a window will pop up. * The file extension may not be visible depending on your Operating System settings. Copy the update files (DSCA100.app and DSCA100.str) to the root directory of the recording medium. 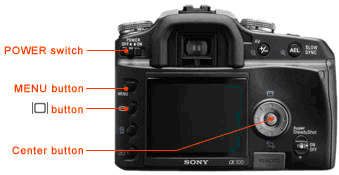 Insert a fully charged battery (NP-FM55H) into the camera or connect the AC adaptor to the camera. Select the setup icon with the controller ( ), then press the Centre button of the controller to display the Setup menu. 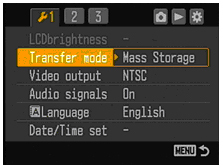 Check that "Mass Storage" is chosen in "Transfer mode" in the Setup menu. If this is not the case, set the Transfer mode to "Mass Storage". Select the Transfer mode with the controller ( ). Press the ( ) on the controller to display the options available in this mode. Select "Mass Storage" with the controller ( ), then press the Centre button of the controller. Press the MENU button to exit the MENU window. Copy the update files (DSCA100.app and DSCA100.str) to the root directory of the recording medium inserted in the camera. When performing the firmware update, use a fully charged battery pack NP-FM55H or the AV-VQ900AM AC adapter/charger (sold separately). Insert the recording medium Memory Stick Duo/ CF card/ Microdrive containing the update files into the camera, then slide the POWER switch to the On position. Use the controller ( ) to highlight "Yes", then press the Centre button of the controller. If you select "No", the operation will be cancelled. The update procedure will now start. When the update procedure is completed, the following window will be displayed. Turn off the camera and then remove the recording medium. A window will show the firmware version on the LCD screen. Check that the version displayed is "Ver. 1.04". If the firmware update could not be performed, contactSony. After the camera was updated, format the recording medium or delete the update files (DSCA100.app and DSCA100.str) from the recording medium.